Airbnb day of service guidelines try to put online data norms in the real world. 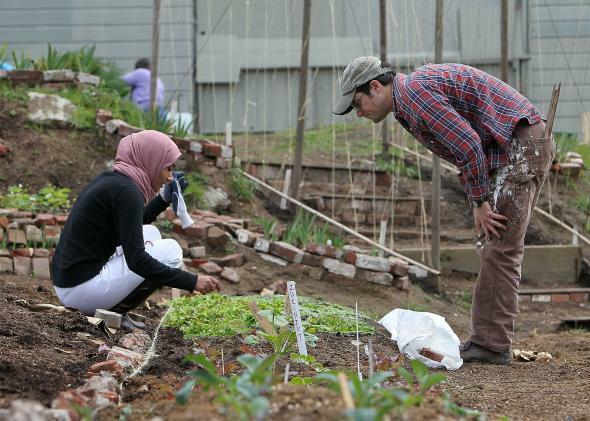 Volunteers at a community garden in San Francisco in 2010. Airbnb sent me a cheerful message last week inviting me to join some of their staff for a day of service in my (and Airbnb’s) home city of San Francisco. I could plant trees at a community center, pick up trash at the botanical garden, or paint fences at a nearby elementary school. This sounded not entirely bad—a lot of people in this city are seriously mad about tech companies and free-market binge operations like Airbnb moving into the city and sending the cost of living through the roof. A day of service would be a drop in the bucket at best, but the sentiment seemed positive: The company is a part of this city, and it wants to be a better neighbor. By signing up for the Event, you agree that Airbnb may record or photograph the Event, (including You, your likeness and voice), and use it publicly or privately in any form of media, including for commercial purposes. By attending, You consent to the recording and photographing and grant Airbnb an unrestricted, perpetual, non-exclusive and sublicenseable license, to take, use, display, perform, distribute or exploit for any lawful and commercial purpose any recordings or photographs. If You do not agree, please do not click “Sign Me Up” and do not attend the meetup. No exceptions. No opt-out. Airbnb was forcing the norms of the online data trade onto the physical world. Like with a social networking platform, I could have an enriching experience and connect with others—for the precious price of my privacy and “likeness.” It was turning the simple act of helping into a product. A cursory online investigation showed that this is a standardized policy across all “real life” Airbnb events. On one hand, this made it seem a bit less perverse—as a potential PR opportunity, the day of service was on an equal footing with any other meet-up the company might organize. But it didn’t change the fact of the matter—if I didn’t want them using my picture or other information, I couldn’t participate in the event. While welcome, the change is far from perfect—not unlike a pre-checked box that says “yes, I agree,” consent is the default response. Research over the last 15 years has shown that a “default” approach to privacy policies takes advantage of laziness and signals to the user that the default response is the standard or more acceptable option. This experience points to two issues that may be interrelated: the new norms of interconnection (and the data that comes with it), and the drive to make an impact (essential among the Bay Area’s tech and innovation elite). It’s plausible that many Airbnb users, especially those in the Bay Area, are happy to hand over their information in exchange for an engaging experience—they probably do it online all the time. And this might be a novelty for them: In my experience, hands-on community service (in contrast to monetary donations) is not common among the S.F. tech crowd. Indeed, whether working for Internet giants or socially conscious start-ups, the majority of the bright eyed twenty- and thirtysomethings that have flooded the area in recent years are very rarely focused on local, “real world” problems. The Internet is a global medium—if you can earn money or even solve problems at a global scale, why shouldn’t you? But while they’re developing new microlending platforms, fighting censorship in Saudi Arabia, or coding new features for Facebook, San Francisco’s tech transplants are often blind to social problems in their immediate physical environs and their ability to make a difference at home. For many, the divide between San Francisco’s pop-tech bohemian billionaire scene and the rest of the city has never felt wider than it does right now. I could say I don’t know where I fall in this scheme, or that I am on the sidelines somehow, but I know this isn’t true. In my neighborhood, which five years ago was considered “dicey,” parklets seem to sprout up everywhere you turn and coffee shops risk losing business if they don’t offer almond milk. I don’t work for a company, and my salary falls well under the median income in the city. I wouldn’t be here if it weren’t for my elite education and my work as an open tech policy advocate. I am constantly engaged in thinking about problems in other parts of the world, and I love my work. But I am almost never forced to contend with social problems in my own city. We should be able to engage without being prompted or organized by companies like Airbnb. But most of the time, we don’t. Airbnb’s day of service will accomplish some things—fences will be painted, trees planted. It may help participants understand or forge some connection with their local reality. But it will also contribute to Airbnb’s ever-expanding trove of data about its users, unless they take the extra step to opt out—and I hope some of them actually do it.